Germany, with a population of nearly 82 million, has seen its influence in the European Union grow significantly in recent years as it has weathered the economic storm perhaps better than any other member state. Having recovered from a recession in 2008, the country narrowly dodged a repeat slump at the start of 2013. Now the German economy appears to be on the up, with economic indicators looking solid. Angela Merkel, as current keeper of Germany’s most coveted political position, the chancellorship, has become the figurehead and perceived key decision-maker of the EU’s response the eurozone’s sovereign debt crisis. Protestors in the southern economies hit worst by economic stagnation have held up banners decrying the impacts of “Merkel austerity”, the chancellor’s campaign to shave sovereign debt by cutting public spending. But in her home country, analysts say that Merkel is enjoying an unusual spell of popular support due to her handling of the eurozone crisis. Most parties have eschewed European issues in their election campaigns, perhaps to avoid taking politically unpopular issues in a country that has largely bankrolled bailouts of other EU states. Disputes have flared among political allies on the banking union and deeper integration, with the feeling being that the subject is too divisive for their electoral campaigns. The Bundestag, Germany’s national parliament, operates on a basis of mixed-member proportional representation, with 622 seats up for grabs from representatives from all of Germany’s 16 ‘Länder’, or states. Merkel’s CDU holds 193 of these, with her coalition partners the Free Democratic Party (FDP) and the CDU’s Bavarian sister party the Christian Social Union (CSU) holding respectively 93 and 44 seats. The Social Democrat Party (SPD) has 146 seats, the Left 76 and the Greens 68. Deutsche Bank Research, the German bank’s analytics wing, says the gap between the combined SPD and Green votes and the CDU/CSU and FDP, the current coalition, has widened steadily leading up to the elections. All five major polls on the upcoming elections have the CDU/CSU at 40%-plus, perhaps enough to win re-election even without their coalition partner, the FDP. The SPD stands at around 25%, the Greens at 12-14% and all but one expect the FDP to achieve at least 5% of the votes, therefore remaining in the parliament. The eurosceptic Alternative for Germany (AfD) party’s predicted 2-3% share leaves it unlikely to enter the Bundestag. Merkel’s biggest rival, the SPD, led by Peer Steinbrück, has struggled in recent years, losing some 10 million voters since Gerhard Schröder led the party in 1998. The party appears to need a miracle surge in popularity to wrestle control of the government from the CDU/CSU in September. Analysts see it as unlikely, due to its predicted share of 23-27% of the vote. “Apparently, the loss of these 10 million voters is irreversible,” said Manfred Güllner, founder of a leading German opinion polling company, Forsa. “If the SPD can’t manage to mobilise more voters, it will continue to stagnate at 25 or 26%,” he told EURACTIV.de. The SPD needs to change its tactics and seal a power-sharing deal with the Greens, the SPD’s preferred coalition, if it is to stand any chance. Or one option would be to fall back on a Grand Coalition with the CDU/CSU but Merkel favours her current “black-yellow” coalition with the liberals. A Forsa poll from 31 July predicted the current CDU/CSU-FDP coalition would win a parliamentary majority (46%) come September. This poll left the Social Democrats with a share of only 22%. In nominating Steinbrück, usually regarded as a no-nonsense economics and finance expert rather than a spearhead of social justice, the party has taken an important gamble. The hope is that Steinbrück, 66, will give the SPD greater credibility over its ability to manage the economy and stand as a real rival to Merkel, whose voters generally associate with high expertise in this area. 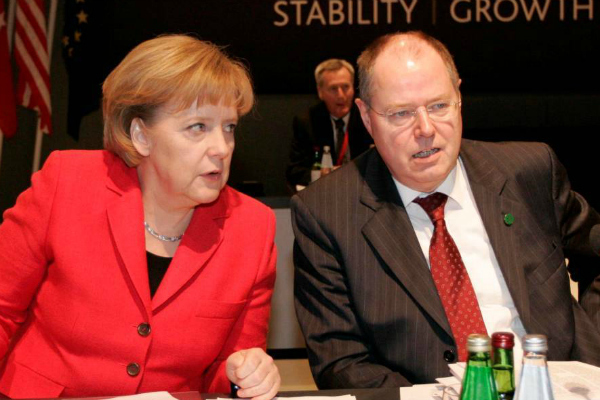 While Steinbrück previously served as finance minister in an earlier coalition with Merkel, seemingly a boost to his economics credentials, he did so just as the financial crisis broke in late 2007 and resulted in recession in 2008. During Steinbrück’s rallying cry at the SPD’s April party conference, he admitted that he had “not resisted strongly enough” during the time of deregulation of the financial sector and market excess, the German broadcaster Deutsche Welle reported. "But we have at least learned our lesson," he said, saying that current centre-left policies of the SPD “will oppose the unchained rules of play and conduct in capitalism". The SPD, which has its roots in the 19th century labour movement, has traditionally pulled in voters through its focus on social issues. As the SPD began its canvassing tour at the end of July, Steinbrück focused his addresses on wages, childcare provision and rent increases. Steinbrück reiterated the SPD’s proposed plan for a 49% rate of income tax for people earning over €100,000. He also spoke about the party's desire for a minimum wage and to break the flow of wealth "from the bottom to the top", saying the SPD should return to being "the party of the little people". "Never again can the risk-taking speculator XY from New York, London or Frankfurt be allowed to endanger the life savings of Heidi Tibulski from Bottrop," Steinbrück said, referring to a struggling Ruhr Valley mining town in western Germany. But a focus on social issues is unlikely to win over many new voters, Güllner says. “The only strong skill still ascribed to the SPD is social justice, but since that is a given, there’s no need to campaign on it,” the pollster said, adding that previous social justice campaigns had failed to garner additional votes or increase voter confidence. “They have the same misconception this time around,” he warned. Adding to the Social Democrats' woes, the CDU/CSU may be attempting to bolster its social credentials by lifting policies from its rival. The CDU has expressed some openness to a national minimum wage but will not push for a higher income tax rate for the country’s top earners. While Steinbrück suffers from his association with the start of the crisis, he may have also shot himself in the foot as a credible social campaigner. Earlier this year, Steinbrück found himself the target of criticism after requesting exceptionally high speaker fees and complaining about the “low” salary of the chancellor, a comment viewed as insensitive. Rivalry has between Steinbrück and the other two main leaders of the SPD, Frank-Walter Steinmeier and Sigmar Gabriel, has also weakened his election push. “What the Social-Democrat campaign is suffering from a strong rivalry between the three top-shots ... particularly Steinbrück and Gabriel”, said Bertelsmann’s Fischer. “There have been some strange contradictions between the party leader, Gabriel, and Mr Steinbrück more recently on issues like, and these are tricky issues in Germany even if it sounds a little ridiculous, the Tempolimit [motorway speed limit],” he said. A matter of weeks before the start of the SPD campaign, Gabriel said that if in government, his party would introduce a motorway speed limit. “That’s kind of committing suicide. What happened was that obviously Mr Steinbrück, as the nominated candidate for the Social Democrats, strongly contradicted,” Fischer said. Leading up to the German elections, few politicians have made announcements relating to the euro crisis and media coverage of austerity and its associated problems had fallen. Merkel wants everything to stay all quiet on the European front, argues Judy Dempsey, an analyst at the Carnegie Europe think tank. “In the run-up to September 22, she does not want the German public asking questions about her management of the euro crisis,” she said. The International Monetary Fund warned in July that Greece needed a debt cut soon if it was to get its finances in order. Greece still owes eurozone countries and the IMF €200 billion, money it may never be able to pay back. “But Merkel and her finance minister, Wolfgang Schäuble, are playing deaf to the IMF’s message. They say that while Greece may need further help, none of that is necessary before 2014, when the German elections are safely over,” said Dempsey. Whenever they could, the CDU’s rivals had sought political gains from Merkel’s hardline cap on public spending. The SDP says austerity has its limits and may be crippling EU growth. He said that Berlin needed to re-examine its role within the EU, especially during the crisis. "Germany has to be a society of good neighbours … Germany should not lay claim to leadership in Europe." "The content and style of crisis management of this government and Ms Merkel have spread doubt in Europe about whether it can count on German solidarity," Steinbrück said, adding that austerity had pushed some economies into a "death spiral". But when a poll by the Allensbach Institute asked citizens to name the more pro-EU German party, 47% said the CDU/CSU, compared to just 12% for the Social Democrats. Furthermore, German support for the EU rose from its 24% low in 2011 to 33% this year. In their electoral campaigns, Germany’s main parties have quietened down on European issues, fearing a public eurosceptic backlash against any move for deeper integration that places Germany as a sort of EU treasury. “All of the major parties in Germany are kind of in a dilemma as regards European policies,” Fischer said. German party leaders are traditionally pro-European but, Fischer said, “on the other hand they face strong opposition in their own parties and they cannot be sure that if they address new issues in the current electoral campaign that they will not achieve an opposite effect to what they originally intended, that is that they mobilise public opposition to any further step towards integration”. “They don’t want to let the European genie out of the bottle,” Fischer said. But eurozone trouble has not deflected support towards protest groups. The Freie Wähler (Free Voters) and the AfD party, founded this year, have tried appealing to anti-euro sentiment. A German poll in April found that 24% of the electorate claimed they would vote for the AfD. But analysts saw this as an expression of general political discontent rather than actual voter potential. “You have to relativise this figure, which comes from a poll conducted six months before the elections, right in the middle of the Cypriot crisis,” said Jacqueline Hénard, a French essayist on Franco-German relations. “What is more, the strongest supporters of the party, like the economist [Joachim] Starbatty, very well known in Germany … believe that this new political group has no chance of entering the Bundestag,” Hénard told EURACTIV.fr. More recent polls confirmed that the AfD had little chance of gaining the 5% vote share needed to enter the Bundestag. Analysts say that it is unlikely that Germany will follow the example of Italy and vote for extreme parties to express their discontent with the eurozone's problems. Rocked by a political and economic crisis, many Italians voted for protest parties in their national election on 24-25 February 2013, with some polls having predicted almost a 20% share of the votes for comedian and wildcard candidate Beppe Grillo. "Rather than following radicals or provoking unproductive conflict, the discontent will likely just abstain from voting,” Güllner said of the German contest. But the AfD could make waves in the 2014 European Parliament elections. “The risk is large that a German eurosceptic movement enters the European Parliament. The alternative for Germany could get a number of MEPs, because they are breaking a taboo in talking about these subjects,” said Hénard, a former Paris correspondent for the German weekly Die Zeit. Despite public attempts from the SPD and Steinbrück to blame Merkel for failing to avert the euro crisis, it may have played to the current government’s advantage. Depictions abroad of Hitler mustaches and Nazi impersonations only served to endear the chancellor to the German electorate. “[They] will likely be helpful rather than damaging for Merkel,” Güllner said. Another group which looked to be growing in strength, the Pirate Party, appears to have not provided enough concrete policy initiatives to woo a significant number of voters in the run-up to the elections, though the party could be viewed as more of a campaign group than a genuine Bundestag contender. Merkel is known to prefer a continuation of the CDU/CSU-FDP coalition. But pollsters refuse to rule out a so-called black-green coalition between the CDU/CSU and the Green Party if she needs votes. Officially, the Green Party is opposed to one, but the prospect of power-sharing with Merkel, who is not against such a coalition, may prove persuasive. This would severely cripple the SPD’s chances of strong representation in the Bundestag. The next option for Merkel is a Grand Coalition, with an SPD as junior partner. Faced with a last-minute decision, Merkel would likely opt for a Grand Coalition rather than an alliance with the greens, according to EURACTIV.de. DB Research sees a Grand Coalition as a possiblity. “To a certain extent, such a coalition with a broad majority in parliament might find it easier to cope with the upcoming issues on the European agenda that will clearly dominate domestic policy,” the bank's analytical arm says. Eurozone leaders have agreed in principal to a banking union, which may essentially set the bloc's largest country as its creditor. The 126-page joint election manifesto of the CDU/CSU, says it “will pledge solidarity with our European neighbours”. But the parties attempted to assuage voter fears that Germany would bankroll the eurozone. “Whoever needs help has to contribute with their own efforts to resolving the problems … We don’t want any euro country to be able to get further into debt at the expense of its neighbours and to avoid uncomfortable reforms,” it added. Hermann Gröhe, Angela Merkel's campaign manager, said he expects the race to tighten in the final few weeks as it did in 2005 and 2009. "The experience of the past serves as a warning to say that good opinion poll numbers 50 days before the vote aren't a guarantee for a good election result," Gröhe told a news conference on 5 August, according to Reuters. "It's a nice tailwind but we've got to guard against arrogance." Hi. We were told to support EU membership because inter alia it would balance Europe where Britain and Germany held too much power. Now we see that the EU has put Germany top of the power pile. This is dangerous considering Germany’s past tendency to go crazy every now and then. The EU embarked on a change to a low carbon economy without carrying out the legally binding Strategic Environmental Impact assessments. Scientists and engineers forecast wind and solar energy cannot work, but they were shunned and the opinion of green ideologists taken instead. These ideologists have no education or technical experience. The result is energiewende = energy swindle. Germany is leading this and leading us all into medieval style hardship. The compliance committee of the United Nations UNECE have ruled the EU and Ireland and the UK to be in breach of its legally binding obligations to carry out the required assessment on their renewable energy programme. If they did they would soon realise that it is impossible to replace conventional fossil fuel and nuclear power generation with wind and solar. 2000 mega watt of wind farms used 42,065 mw of grid power in 2012, enough to power 9,000 homes. Wind causes the existing power plant to run inefficiently so you were better with no wind at all, Consumers still must pay for it. Its a swindle. In the German bite, North See, they are using diesel generators to supply power to the wind turbines because there are no connection from the mainland to the off shore turbines. Germany is selling power to vital industries at a discount to keep them from moving abroad.